Dr. Romanoff brings over 10 years of experience to our practice, and she comes all the way from Karaganda, Kazakhstan! She is currently living her dream as she knew she wanted to be a dentist from the tender age of 10. 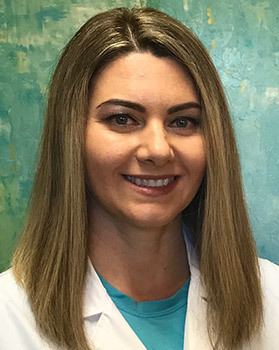 She has been practicing in the U.S. for about 5 years, and her favorite parts about being a dentist are enabling her patients to overcome their fear of dentistry and educating them about how oral health connects to overall health. After graduating from the Karaganda Nursing College, she attended the Karaganda State Medical University before finally graduating from the University of Colorado School of Dental Medicine. Afterward, she went on to receive additional training in both laser and implant dentistry. During her free time, Dr. Romanoff enjoys yoga, hiking, cooking, painting, and hanging out with friends.